Janelle Monae joined Skai Jackson for Nickelodeon’s 2019 Kids’ Choice Awards on Saturday (March 23) in Los Angeles, California. Never one to stray too far away from her first love; black and white, the actress -singer was back on top form with her signature style. 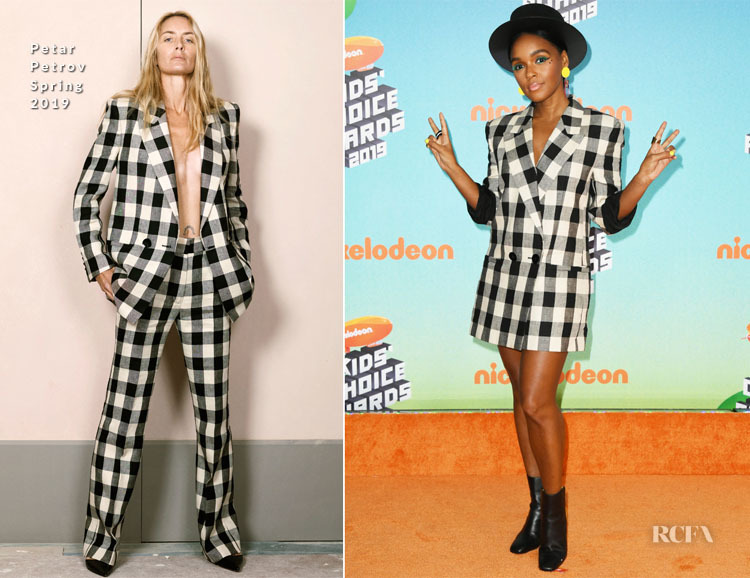 The graphic gingham Petar Petrov Spring 2019 blazer may not have been intended as a dress, but Janelle makes it work. I like how the tailoring keeps things smart, with the strong silhouette and stitching at the midway point gives this a feel of dress as it forms two portions. Janelle was not about to leave the house without some aesthetically pleasing accessories, which included her yellow earrings and YVY leather hat. Could she have opted more interesting footwear, or do these boots serve their purpose?